A common problem with mobile computing is the inability to find a comfortable and safe computing position without using some sort of TV dinner-type stand or pillow. It's no secret that my Core Duo MacBook can get rather hot and that my swimmers prefer cooler climates. 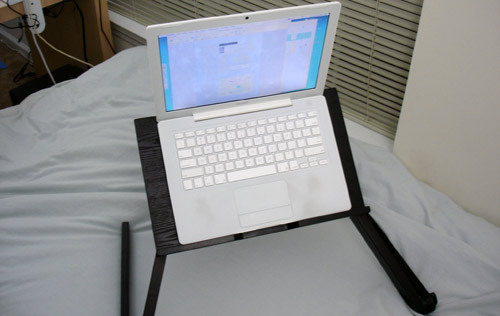 When LapDawg asked me to review their laptop stand, I couldn't decline. Disclosure: LapDawg gave me some scrilla for this ReviewMe (aff) review. 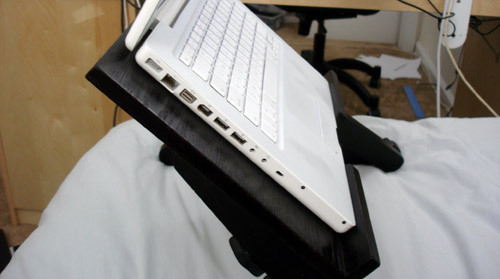 LapDawg is a hands-free, adjustable and portable laptop stand that allows you to compute more comfortably, regardless of whether you're on a couch, bed or against a wall. While the LapDawg is portable in the sense that it's lightweight and can be easily disassembled, don't expect to see people on the floors at SXSWi using these. The LapDawg has a number of uses. 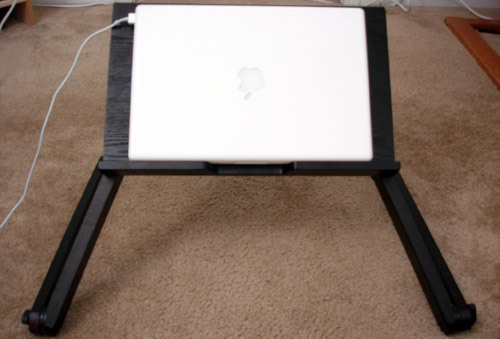 Personally, I keep my MacBook under my bed when I'm not using it. I have found the LapDawg quite handy when I want to use the MacBook without getting out of bed on those lazy Sunday mornings at 4pm. Where my MacBook lives - under the bed next to a throttle body and some old sneakers. 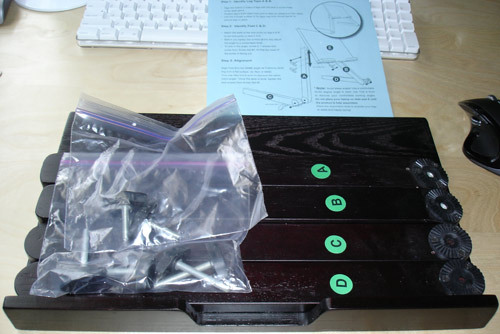 The LapDawg website has a list of uses for the LapDawg including using it as a TV tray, book holder and lap writing desk. While I do agree that the LapDawg can fill a number of uses, it is not for everyone. Specifically, if you have a larger laptop, the LapDawg might not work out for you. As you can see below, the LapDawg is only slightly larger than my 13.3-inch MacBook. Any larger and the laptop would hang over the top edge. However, if you do use a MacBook or similarly-sized laptop with the LapDawg you won't be happy that the front "ledge" is taller than the thickness of your laptop. When typing or using the trackpad, this gets in the way and becomes an annoyance. To combat this, I think it is best that LapDawg start offering different sizes and perhaps a "mobile desk" version with space for a full-size mouse. I also felt uneasy about the strength of the joints. You adjust the angle of the LapDawg by loosening and tightening a joint that has notches. With decent pressure I believe the joint would be heavily stressed. I can only imagine what it would do if you had a 17-inch laptop and applied pressure on it when typing. Of all those, my biggest beef with the LapDawg was that it didn't feel sturdy. I like to know that the things I buy can live up to a beating. I wouldn't buy a supercharger kit for my car if it couldn't withstand an extreme range of temperatures and RPMs, the same goes with the LapDawg.. in a sense. What laptop accessories are a must for you when couch surfing or the such?